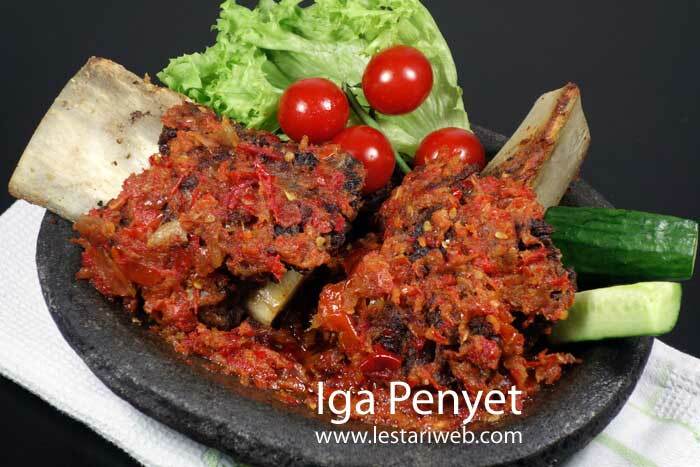 For you who like to experiment with Spare Ribs recipes. 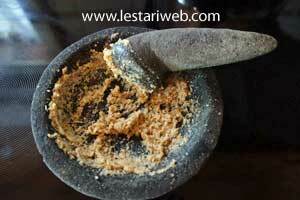 Here it is a specialty of Sundanese folks, whom my lated father belongs to. A unique combination from deep fried beef spare ribs and spicy hot chili Sambal. 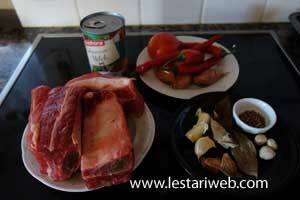 If you are a chili fan, give it a try and let me know the outcomes. Have a nice cooking ;-). Attention : It's spicy!! 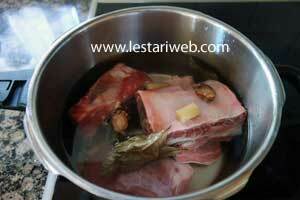 1Pour in 1.5 liter water in a deep saucepan, add spare ribs, litle bit salt, salam leaves, lemon grass & galangal. 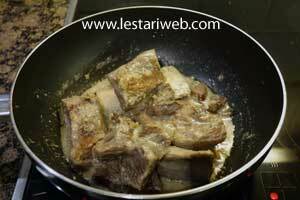 Cover the pan and cook the spare ribs until tender. 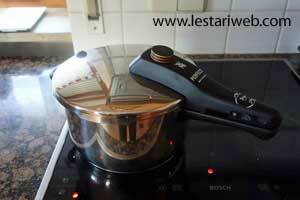 If preferred you can use press-cooked cooker and boil for 30 minutes since the cooker begins to sizzles. 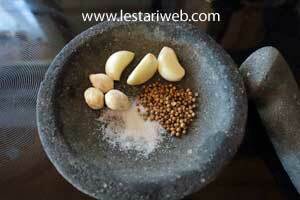 Grind ingredients for the paste with stone mortar & pestle or blender into smooth paste. Transfer the paste into the pan. 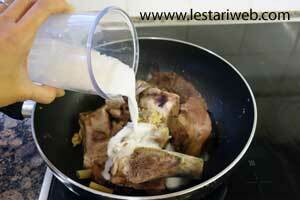 Add 250 ml water & stir to mix. 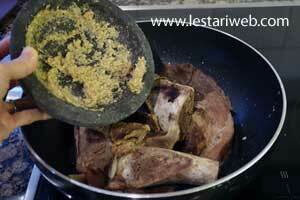 Add the paste into the pre-cooked spare ribs. Stir to mix. Pour in the coconut milk, stir to mix. Cook on a medium-high heat until until the coconut milk get boiled. 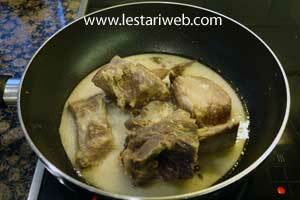 Adjust the heat into medium and simmer for 20 minutes uncovered until the coconut milk becomes thicker and oily. Stirring occationally. Important: Adjust the taste. Add salt if necessay. 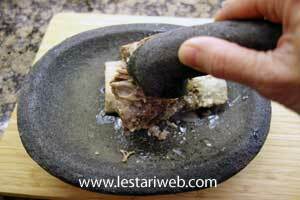 Bruised / crush the spare ribs slightly with the pestle or meat tenderizer. Make sure you don't destroy the meat ;-). 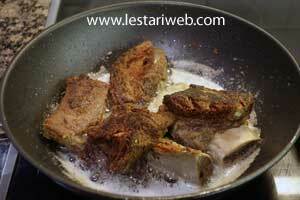 Frying spare ribs : Heat enough oil in a frying pan or deep fryer and fry the spare ribs until golden brown. Set aside to drain. 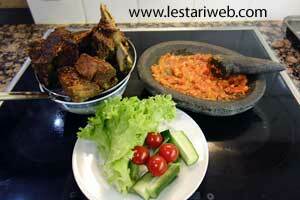 Serve fried spare ribs right away with rice, raw salads and sambal. You can replace with another sambal if you wish. For those who doesn't mind with the smell of shrimp paste / terasi, please take Sambal Terasi Goreng as it usually used in the original recipe.